A general community for the CW's new show called The 100. 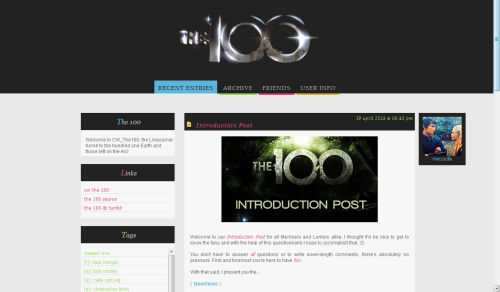 Come and join us for weekly episode discussions, promo & episode stills, news, interviews, fanworks, and so much more over at cw_the100. The storylines (on Earth as well as up on the Arc) have a lot more depth than one is sually used to from the CW - especially in recent episodes they didn't hold back with drastic decisions. The characters aren't light and stereotypial, no, they have all darkness hidden somewhere inside them, their fears and probelms to deal with, and have to find a way to conquear their own shadows. I'm watching it...but I'm watching it with the level of interest I'm watching Resurrection, some of it's a little too CW for me (adults as teenagers, flimsy explanations for things, I was surprised with Wells - but not Charlotte ...etc). But that said - it's not horrible. I do think it's going to be a popular fandom (Tomorrow People like)- coz it has those tinges of TVD teenage-drama with a supe twist, and it's not as ridic as I hear (hear - coz I can't quite bring myself to dl it) Star-crossed is. Plus it's in Space. You can't really go wrong with space, well - you can. But there's also planetside goings on. So...it should be fine. There's a ton of Wondercon stuff you'll be able to use too. Hope this doesn't mean that Masterlist is going to take even longer now?...JK. *laughs* And that was your bi-weekly reminder or whatever. But for reals if I don't hear from you much over at NBC_Rev - during discussions/rewatches - I will hunt you down over there find you and hug you until you come back. I need you. *nodsnods* Yup. Their characters (Clarke & Bellamy) are just like Charlie & Bass. And not only their initials, I mean. WHEEEE, THANK YOU!!!! You are my inspiration for this community. *flings herself at you* THE QUEEN OF REVOLUTION! HA. UHM. NO? *lalala* I will get to it. ONE DAY. *hums* I'll be back to Revo soon. I already spazzed in the Sizzle Reel Post you made. I was torn bewteen grinning, crying and flailing. Yup. Ui, das setzt dann aber hohe Maßstäbe XD . Ich kriege ja hin und wieder bei Tumblr was mit, das sieht schon gut aus :] . Schön, das klingt nach nem guten Ausgleich ♥ . Ja, mir gehts soweit auch gut :) . Ich würde gerne mehr von dir hier lesen :/ . Didn't know you were still around. Hi! I haven't seen you post here in ages! But then, I'm a terrible F-List friend - you've probably been around and I just missed it. I saw the first season of The 100 - it has a lot of good acting; I like it even if I keep thinking I'm watching a reality apocalypse show: which teen gets voted off the island (killed off) next? Am I making sense? Die kann man sich ja schon mal krallen *hihihihi*. Nawwwwwww! Aber du hast ja auch so noch nen paar ungepostete Icons? Da kannste ja sonst mal nen Random Post machen :) .